Tourism Ireland’s 2019 sales mission to India and the UAE kicked off yesterday. A delegation of Irish tourism companies – including Irish Rugby Tours (based in Carrigaline, Co Cork) – is participating in the targeted sales mission, to grow tourism from both markets. 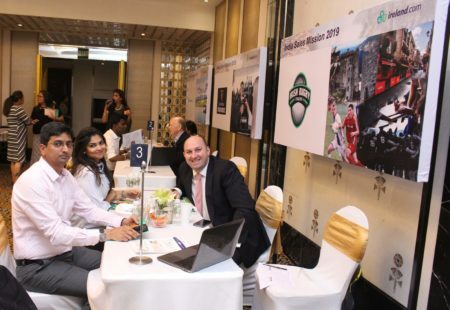 Over the coming days, Irish Rugby Tours and other companies from Ireland – including hoteliers, visitor attractions and destination management companies – will meet and conclude deals with around 300 tour operators and travel agents in Mumbai, New Delhi, Abu Dhabi and Dubai. The delegation will also meet influential travel journalists and bloggers, highlighting why Ireland is such a wonderful choice for a holiday. The main objective of the sales mission is to engage with key travel professionals in India and the UAE who promote and sell the island of Ireland and to encourage them to extend their Ireland offering, or to include Ireland for the first time, in their brochures and programmes. As well as highlighting ease of access to Ireland, a key message for Tourism Ireland in India is the British Irish Visa Scheme, which allows Indian travellers to visit both Ireland and the UK, including Northern Ireland, using a single visa; and, in the UAE, the fact that Ireland is now visa-free for UAE nationals. George Hook, Irish Rugby Tours (right), meeting with travel agents in Mumbai, on day one of Tourism Ireland’s India sales mission.